The huge bear lifted his head in my direction. He knew I was there but he couldn’t see anything thanks to my camouflage. As much as I wanted to sit and watch him feed, I couldn’t stay motionless for long. The mosquitoes were relentless and biting me through my clothing – from my face to my fingertips. I also had cameras and provisions on my back for the night ahead and in 30-degree heat, I was struggling to see for the mix of sweat and Deet running into my eyes. I made the decision to push on and seek refuge in my hide away from the insects and sun, hoping the bear would return to the clearing later and give me a chance to photograph him. That encounter with a brown bear deep in Estonia’s Western Taiga forest helped me prepare for my upcoming African expedition. As a wildlife photographer I need clothing that will protect me against biting insects and help me cope with intense heat. That’s why I choose Rohan’s Overland shirts. I started wearing the short-sleeve versions while photographing African wild dogs in South Africa a couple of years ago in confidence that the UV-resistant technology would protect me during long days in the harsh African sun (having had a biopsy a few years ago, this technology is important to me). This time around, not only will I be taking the Ultra Silver t-shirt to provide that extra layer of UV protection but I’m consciously adding the long-sleeve Overland shirt to my list of essential gear too. Over the next two months I will be dodging hippos while canoeing Botswana’s Selinda Spillway, photographing bird life and unparalleled elephant congregations on the Chobe River and tracking predators in Zambia’s Busanga swamps. With malaria a very real risk in these watery wildernesses, I’m going to need the Biteguard™ anti-insect technology of the Overland range as much as its UV protection. The neutral colour palette of the range is also an essential consideration for me when tracking dangerous game. Because a large number of mosquito bites happen close to the ground, I need to be sure my legs are equally well protected. I count on Rohan’s Trailblazers trousers to deliver this through their Biteguard™ protection. These are without doubt the most comfortable trousers I’ve ever worn and the high degree of stretch in the fabric makes these the perfect trousers for any photographer who – like me – throws himself around a lot to find the best angle on a subject. The convertible option will also allow me to turn those trousers quickly into shorts – perfect for the African winter where cool, crisp mornings quickly give way to hot days. 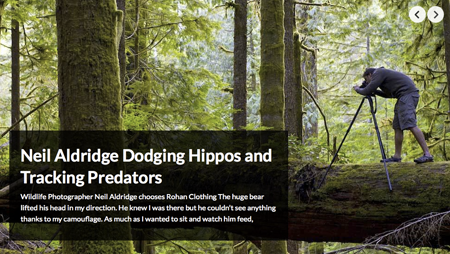 The heat was also the defining factor when deciding to travel with Rohan’s Freight Vest. I’ll be honest, I used a similar vest made by another manufacturer for years but found it stifling and heavy both on location and while travelling through airports. While I’m walking in the Kalahari Desert in a few weeks time I’ll be grateful for the Freight Vest’s breathability, as well as the conveniently sited pockets large enough to carry my spare DSLR cameras, lenses and batteries. Having this vest with me will mean I will have the flexibility to leave my camera bag behind if I want to and shoot with more freedom, spontaneity and creativity. I guess those three words sum up how many of us like to travel these days too. Thanks to Rohan, I now can…because I just can’t afford to stop and worry if my gear is going to stand up to the challenges I set it. Do you want to take better wildlife photographs? There’s no better way of learning than in the field so why not join me on one of my exclusive photo trips? As a professional wildlife guide and award-winning photojournalist, I take pleasure in showing people the beauty of our natural world. I invite you to join me on one of my photo tours to Europe or safaris to Africa, created to offer you the perfect opportunity to experience some of natures most inspiring places and to learn how to better photograph its wild wonders. Africa has a diversity of wildlife, breathtaking scenery and stunning lighting that makes it a favourite with photographers. Wanderlust, the world’s leading travel magazine, has selected my Land of Giants African photo safari as one of their top trips for 2012, as seen in their December 2011 issue. This exclusive photographic tour to the Limpopo Valley is led by myself in partnership with carnivore expert Dr Peter Neville. Check out my website for the full safari itinerary, trip information and how to make a booking with my expert travel partners Tracks Safaris. Done Africa? Perhaps you’re looking for a new adventure? I’ve teamed up with leading Estonian wildlife photographer Remo Savisaar to offer just 6 people the chance to discover and photograph Estonia, one of Europe’s wildest countries. This exciting new 9-day photo tour combines specialist photographic tuition with expert wildlife guiding. So why not take a look at the itinerary we have in store? With professional training and qualifications in both photography and wildlife guiding, coupled with experirience and an award-winning quality, I believe my photo tours offer the right package for you to improve and enjoy your wildlife photography. Working with leading photographers and guides adds even greater value to your experience. But don’t just take my word for it. Come and see for yourself.